Joe Namath was larger than life in his heyday. Now he's literally entering another dimension. "Broadway Joe" is back in the spotlight, but this time as a hologram at the Pro Football Hall of Fame. He'll appear in the new "A Game for Life" exhibit, which is designed to make visitors feel like they're eavesdropping on a real pro-football locker room. 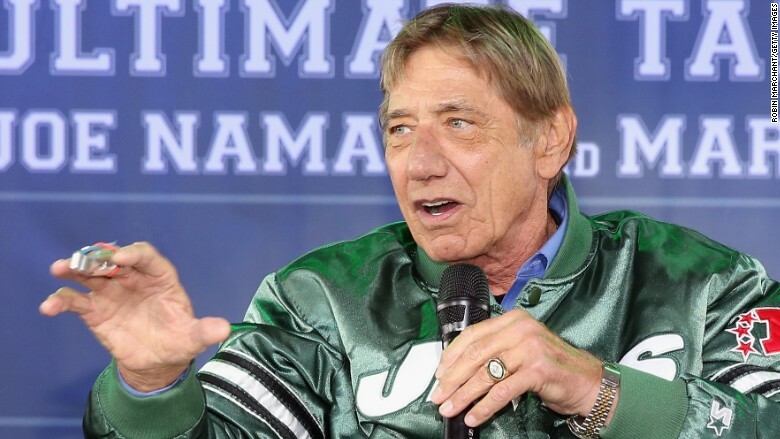 "Boy, they're going to get some goosebumps," Namath told CNNMoney. He said the show aims to inspire viewers by showing how the values players learn in football can help people overcome everyday obstacles. "Football teaches you to have respect for one another," he said. "It also makes you realize you don't get anywhere on your own. Life, like football, is a team effort." For Namath, who "never even dreamt" he'd be inducted into the hall in Canton, Ohio, the hologram is a thrill. "It's almost too much for me to think about," Namath said. "It's been such a positive experience. I can't wait to see it myself." Namath was filmed several times over the last few months to produce the footage for the hologram. And, no, he won't be shown sporting one of his famous fur coats. Visitors will sit on benches in a replica of a locker room. Namath's hologram will then appear and talk to them. The hologram is of him now -- well after his days playing professional football. But the Hall of Famer spoke to CNNMoney about his youth and the lessons he learned throughout his football career. "I used to daydream in class, in grade school, and the sisters would give me a rude awakening," Namath said. He was discouraged from dreaming until he went to the University of Alabama and played under Paul "Bear" Bryant. "He told us: 'If you don't dream about it, it'll never happen,'" Namath said. Football also helped him in other ways. "I was under the wrong impression, you might say, for many years," Namath said. "I was enlightened by my football family. I met people that helped my attitude. I realized that if you don't have some humbleness in your soul, you've got more to learn." Namath is one of several football greats who will be featured in the upcoming exhibit. Holograms of Jim Brown, Curtis Martin, Jim Kelly, Alan Page, Steve Largent, George Halas and Vince Lombardi will also take a turn talking to viewers. Halas and Lombardi are performed by actors. "When I see the guys in the Hall of Fame, I get so tickled," Namath said, of his fellow inductees. The exhibit will periodically rotate other notable figures into and out of the lineup of holograms. The show is about 13 minutes long and will set the tone for the rest of the museum since it's the first stop for visitors. The holographic show is expected to cost $3 million. It's part of a $500 million renovation to the Pro Football Hall of Fame Village.